Today I announce my first E book exclusive. Watch Your Back is all new material, a novella and three stories of suspense. Page turning stuff. At least, that’s my claim. For less than a Starbucks latte you can test that claim for yourself. I’d love to hear from you if I’ve done my job. It’s available for the Kindle and the Nook. This is all an exciting development for me. While I’m still working under a traditional contract, I see this arena as a way to complement that work. I’ll be growing new readers and giving my current readers more product. What’s not to like about that? But mostly it’s about the writing. See, I always wanted to do one thing, since I was a kid: write stories. Write books. The kind of books I loved to read. Page turners. Twisty plots. Up all night stuff. I had to work hard to get there, but I did. And I’ve appreciated every moment of the ride. There were some years I put out two novels in a year (and once or twice with a non-fiction writing book thrown in). But that had to be it, because of publishing schedules, limited shelf space in the stores and so on. Now I don’t have to wait 18 months for a book see the light, or worry about getting more than spine-out shelf space once it does. I can have a book out there as soon as I think it’s ready. And readers can have it in their hands in seconds. I always admired the pulp writers of the golden age. The era of Black Mask and Chandler and Hammett and Cornell Woolrich, guys writing fast and furious for a penny a word, providing stories for a voracious public. Turning out some of the greatest examples of American suspense ever written. I wanted to write in that tradition, and now I can. It begins here, with Watch Your Back. In the title novella, hotshot IT guy Cameron Cates seems to have it all. A secure job, a fiancée who loves him and the prospect of a steady life ahead. But then he sees her. The new woman at work. And like watching a car crash in slow motion, Cam knows he can’t turn away and is powerless to stop what happens next. A tale of lust and greed and corporate America––and what happens to dreams that become all too real. Fore Play is the story of the world’s top golfer and the trouble that follows his off the course activities. Let’s put it this way: his game will never be the same. In Rage Road, a nice young couple thinks they’re out for a smooth ride through some lovely country. The truck behind them has a different idea. Married man Frank Dabney has learned to listen to his wife, Susie. But in Heed the Wife he finds out he may have listened one too many times. 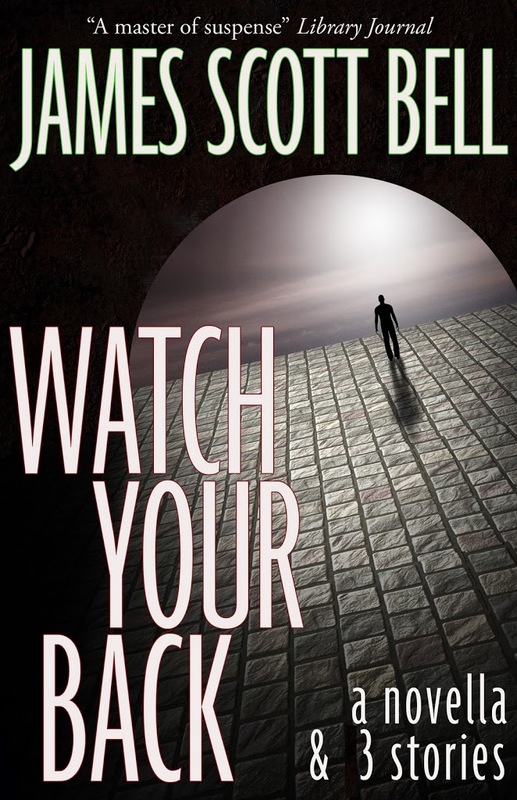 For Watch Your Back I hired cover designer Jeff Gerke (if you’re interested in his services you can contact him by going here. Tell him I sent you). I had beta readers read and edit the content, and hired out the text formatting. But the stories are mine and it’s an absolute thrill to be able to share them with you now. There’s more to come. Is this a golden age for writers or what? So allow me to consider this a launch party of sorts, for Watch Your Back and my future e-books. I’m just sorry I can’t offer you a glass of wine and some gourmet cheeses. But I’ll hang out here today and read your comments and answer any questions you might want to sling my way. 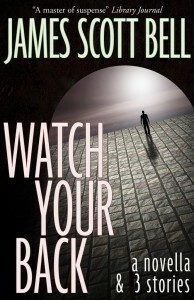 This entry was posted in book launch, James Scott Bell, Watch Your Back by Joe Moore. Bookmark the permalink. Wow! Love the cover and the stories sound really intriguing. Congratulations on your new venture. I’m really excited for you. I especially like the anthology of short stories approach. And also, thanks for sharing your terrific cover designer and how you farmed out the text formatting. After my blog this week on ereaders and the new digital age, i am buying an ereader and will check out your new ebook. I also like the idea of infusing your offerings to readers with books like this. Its a way of keeping your name out there without all the wait time thru your publisher. Its a win-win really. Your house can also reap the benefits of you building up your readership base. You are a timely inspiration for me. Thanks! You might want to look at distributing through Smashwords as well (if you are not already). With Smashwords you can sell also get your work sold through Kobo (Borders e-platform), Apple, Diesel & Sony. Worth checking out. Just downloaded it, Jim. Good luck in this brave new world of publishing. Just downloaded it to my KIndle for Mac–looking forward to my next “Jim Bell story fix.” Congratulations and best wishes as you launch out into this brave new world, while some of us are still standing on the shore dipping our toes into the unknown waters. Jordan, thanks for the good word. I do think win-win is an apt term for this. David, thanks for bringing up Smashwords. I have delayed here to do more research. I’ve heard there may be a downside, but I’m not sure. If anyone has a comment about Smashwords, I’d love to hear about it. Joe and Doc, thanks for the downloads. I appreciate it. It’s so cool that I can track results daily, and will receive compensation monthly. Talk about a brave new experience for an author. Love it! The title is great and Jeff did an awesome job on the cover. We’ll all be anxious to hear your feedback on this venture, Jim, but it is a win-win. Like Jordon, I also have decided to jump into the e-reader world and will be downloading your story soon and spreading the word. Very exciting! Jillian, thanks for spreading the news. Everyone agrees that word of mouth has alway the best marketing for a book. In the digital age, that can happen fast and wide in a hurry. Congratulations, Jim. You know it will be on my Kindle before the sun sets. I have found Smashword to be as easy to use as the others and the only downside I can think of is they pay quarterly, not monthly. Awesome!!! And by the way, I completely agree about pulp fiction writers. Raymond Chandler was, in my opinion, a genius. Maybe I’ll see some of that kind of genius in your ebook. Keep it up, Mr. Bell! Hey Mark, thanks for the support. And you know I’m pulling for your own e-books. David, I think it had to do with how much info one could upload to B & N via Smashwords, as opposed to directly via PubIt. Thanks for getting back to me here. Brayden, your optimism is encouraging! Thanks for stopping by. I’m completely with you in the great Chandler. Wow, how awesome that you’re doing this! I’m totally going to download it to my Nook. The stories sound intriguing and I love the cover. It’s very eye-catching. Best of luck on this fun adventure. I hope you report back to us on your experience. Thanks Laurie. I will definitely report back from time to time. And the nice thing is, everything is gravy. You’ve got to be careful about Kobo. I have heard from other e-authors that they tend to discount. And Amazon goes for the lowest price and will beat Kobo, so you could end up screwing yourself in the royalties. Good luck on this, Jim, and looking forward to hearing how it’s going. Jeri, thanks for that. That’s exactly the sort of information I’m looking for! So if someone were to publish via Smashwords, and then Kobo took that and gave a discount, Amazon might then discount on their site? Since Kindle is by far the biggest slice of the pie, that could indeed cause some major hurt. Anyone else have anything to add on that? I think we authors have no choice but to jump in with all fours into CyberSpace. I have written eight books, the best-selling Keystone Stables series, pub. by Zondervan. The company decided to put book one on Amazon as a free e-book. Not much royalty there, right? However, the logic is reasonable. Okay, whatever works to sell a book or two is fine with me. The Kobo/Amazon issue has definitely cropped up for some writers I know, so be careful about the discounting. What does your print publisher think about your self-publishing? Indeed, Marsha, that’s the right philosophy! Boyd, thanks for that further info on the Kobo thing. I do now recall an author to whom this happened. So I’m going slow. All is well with publisher and agent. I discussed this up front. This is, after all, a collection, and not the sort of thing that was likely to be pubbed anyway. I see it as part of the overall marketing plan for my books. Cutting edge as always, Jim. Glad to have your machete wielding prowess out in front for us. Don’t own a Kindle, but my wife does. She’ll love this. We’ll be downloading a copy as soon as she gets home. All the best on this new adventure. Going to keep an eye on this trail you’re hacking out of the jungle for the rest of us. Hey Shawn, thanks for stopping by. I appreciate the atta boy. Dan, I also have depended on the forerunning of others. Writers are a very generous community. I think the discounting issue has been resolved by smashword. I distribute direct with Amazon and Pubit, go through Smashwords for kobo, apple, diesel & sony. Doing this I have to keep my pricing the same (which was part of the price matching issue I think). Only way to get in to sony and apple (ibooks) that I know. And Apple and sony are big enough pieces of the pie to not want to ignore. James, so glad to hear you’ve got something else out. I’ll be downloading to my kindle as soon as this message is done. I love all the fiction you’ve written, I’m just afraid that with short stories they will be over too soon! Also, per other comments, I have bought some “free” kindle books, first in a series. It’s a great way to find out if i’m going to like the seriess. David, thanks for that. If Kobo was the only problem, that may be moot now with the bankruptcy of Borders. Yes? Just grabbed this for my Kindle, Jim! Always looking for good short story collections, and they’re getting harder and harder to find! Looking forward to yours! And kudos to Jeff–great cover! Sara, that’s why I also included a novella. I like that form a lot. It’s in the style of James M. Cain. BJ, I appreciate your kind words, as always. Right. Kobo is way behind in posting stories/novels from indie publishers, Smashword is trying to work through the issue, but I think considering the recent announcements its a dead market. BTW I just received word of my first overseas sales from Apple. Eight stories sold in Dec. in Australia. Oh, I’m sooooo excited to read this! I’m going to B & N right now. 🙂 I can’t wait to see how this works for you! What a super idea! Hey Susie May, I hope the guru of all things fiction likes it! Outstanding! Among the thousands you’ve sold already today I am the one from 9:37 this morning. Tagged it before heading out to church. Best of success with it. May God’s hand guide it were luck & fate can do their best with it. Basil, I thought I felt a little jolt this morning. Thought it was either an aftershock or a sale. Must have been you! Hey, thanks for the good wishes and I hope you enjoy the book. UPDATE: I just took a peek. Watch Your Back was at something like 83,000 in the Kindle store when I posted this. Just now, almost 4 p.m., it’s at 3,222. I’ll take an 80,000 point jump. Thanks all. Wow! What a great idea – and I have a Kindle just waiting for a download. I love my Kindle, and I love your books. They make a great pair! Loretta, thanks so much. Enjoy! Sounds epic! ^_^ I love the title, too! It reminds me of a newspaper heading I once saw as a little girl, and it only makes me actually want to read the book even more. The epic cover also makes me want to read the book as well, ansd the plot sounds really interesting! Nice job, very origional ^_^ Will the book be published as a traditional (sp) book as well? Or only in eBook format? Thanks, Clare. I’ll keep you posted. And Chiaki, I have not planned a print version, but I understand others have done this via Amazon’s CreateSpace program. If anyone has any info or advice on that aspect, I’d love to hear it. Awesome. Just downloaded it from Barnes and Noble. Also let my Read 52 books in 52 weeks group now about it. Fantastic e-book, Mr. Bell. Great cover that comes with the book and isn’t just used for display. Tight formatting to keep the reading fluid. Last but not least a low price! I didn’t even finish reading the first four pages of the sample during my lunch break. I skipped ahead to the Buy It link. Wishing you the best success with this release. Robin and Aaron, I really appreciate the kind words and the downloads. Enjoy! GOT IT! Looking forward to reading your latest and greatest, Jim. Glad you are showing us how to make use of e-book opportunities and still stay in the good graces of “traditional” publishers. You might want to tell people that they don’t necessarily need to buy e-readers to access the book. Kindle has free apps to use on Mac, PC, Blackberry, etc. I’m only sorry you didn’t ask me to be a beta-reader/editor. Would love a gig with you! See you soon at Mt. H! Jeanette, email me and we can talk about the Beta reader thing. See you soon. Awesome, Jim! Great cover and as always, it hooked me. Thanks for the good wishes, Martha. Enjoy. Congratulations, Jim. I’ve got Kindle for iPad so I’m going to buy it. Also, regarding Smashwords. They have their own little formatting bumps you have to navigate. Once you put it up, I would look it over if I were you, line by line, just to be on the safe side. Thanks for the added tip, Mike. Late note on the ebook…. Jim, I’m currently having a difficult walking because you’ve made made me laugh my aff off.